Heather Barbieri worked for years as a journalist, freelance writer, and guidebook author. Eventually she saw her fiction published in literary journals and then, in 2004, her first novel, Snow in July, was published by Soho Press. 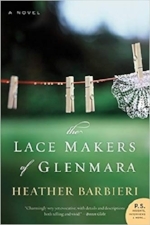 The Lace Makers of Glenmara is her second novel.